Wishing all of you who celebrate,a very Happy Pongal/Sankranthi. As it is,we do not celebrate Pongal.Just like people stared at us when we said we do not celebrate Onam/Vishu in Kerala,I am met with similar glances if I do not put a Kolam and sugarcane in front of our corridor.So I've been doing all the pre-requisites for Pongal since last few years so no more discussions on "why" we do not celebrate the harvest festival.I have to admit it is fun though,after all festivals are fun and celebrated to spread joy and happiness around!! The best part of Pongal is,undoubtedly the food.I mean,there are so many variations of Pongal that it is really difficult to chose which one to eat first.To know more about Pongal,read this post by Shanthi Krishnakumar.Also Check out Bharathy's detailed Pongal post replete with stunning pictures. Last year during Pongal,I made Ven Pongal and Sakkarai Pongal for breakfast,but the recipe was not featured here.I thought this year I am not going to miss posting it at any cost since it is so good. Wash well and cook rice and moong dal along with milk and water in a pressure cooker for 10-15 minutes or till 4-5 whistles. Once the rice-dal is cooked well,add grated jaggery to it and mix well[at this point,if the mix is very dry,you could add a few tbsp milk or warm water]. In a kadai,add ghee and roast the cashews till golden brown. Add cardamom powder,nutmeg and saffron strands to it and give a good mix. 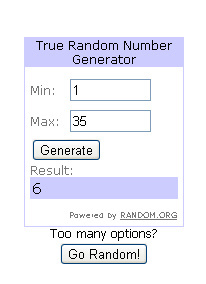 Now the winner of my giveaway.I chose the winner through random.org. Comment # 6 - HS - Hi Divya. I have been silently following your blog and trying recipes. I dont have a blog of my own as yet but would love to some day. And, on weight loss, i am also someone who is eternally on a diet. I read Rijuta's first book - Dont lose you mind, lose your weight. That was good. Would love to lay my hands on this book. Please pick my name! Congrats HS,please send me your address to divyakudua@gmail.com[If I don't hear from you for 5 days,I will choose another winner] [I have chosen another winner since I didn't hear from HS]and thank you to each and every one of you who commented with great weight loss tips.I wish I could send the book to every one of you..but,you know! !No worries,I have some more exciting stuff coming up for giveaways,so keep watching this space!! 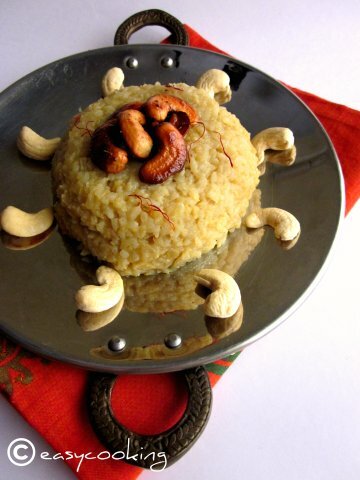 Pongal looks absolutely delicious..Happy pongal to u and ur family..Congrats to the winner..
Pongal looks great. Congrats to the winner..
wish ya happy makar sankranti,. Happy Sankranthi! And the clicks are awesome and needless to say they would gr8 too! While you announce your Giveaway's winner, you won a Giveaway at Suma's! You truly deserve it Divya. And I'm happy you won it coz we would get to see more bakes and cakes at Easy Cooking! 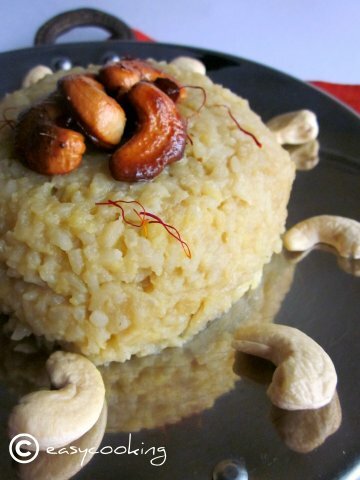 Like the presentation of the delicious sakkarai pongal! Happy pongal to you, Divya.